This year’s festivities include new and returning sponsors as well as activities in Katahdin Woods and Waters National Monument and the surrounding communities. 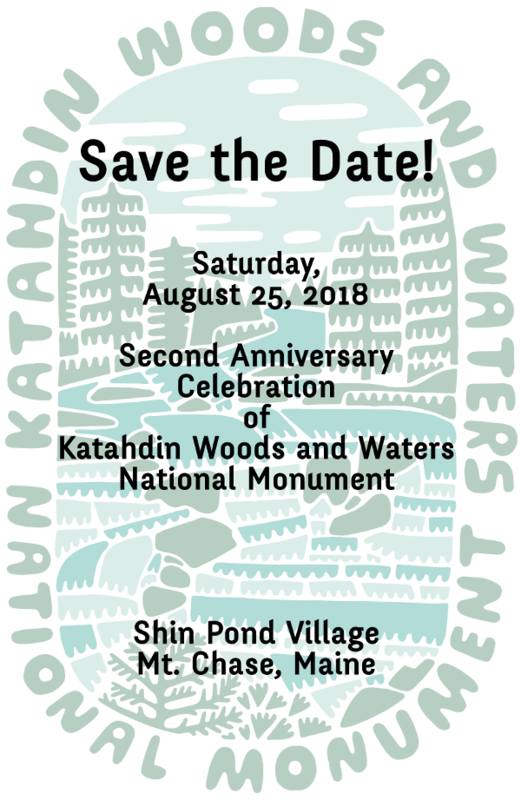 Patten, ME — Friends of Katahdin Woods and Waters released details of the 2ndAnniversary Celebration of the establishment of Katahdin Woods and Waters National Monument today. The celebration, presented by Friends of Katahdin Woods and Waters and Maine Beer Company, will be held on August 25that Shin Pond Village in Mt. Chase, Maine. The evening will include beer from Maine Beer Company, dinner from Patten-based Casual Elegance Caterers, and a silent auction of outdoor gear, experiences, and memorabilia. The special evening will feature a performance from the Magic Eight Ball Quartet, sponsored by The Wilderness Society. Weather permitting, guests will get the chance to experience the exceptional night skies of the area by walking a short distance from the event to telescopes and an interpretive presentation. Tickets for the Saturday night celebration are available for $25 at www.friendsofkww.org/anniversary. Maine-based outdoor retailer, L.L. Bean, is sponsoring activities that encourage attendees to “Be an Outsider” and explore Maine and the nation’s newest public lands before and after the event. Organizers have posted suggested trips including hikes, paddles, bike rides, and drives throughout the monument. Visitors are also urged to support the surrounding communities by booking local accommodations and shopping at area businesses. During the weekend, attendees of the anniversary can visit the Patten Lumberman’s museum to learn about the rich logging history of the region. Attendees can also visit North Light Gallery in Millinocket to meet local painters who will be displaying recently produced Plein Air works showcasing the natural beauty of Katahdin Woods and Waters. Host and sponsorship benefits are available to interested individuals and businesses. Patagonia is hosting a private reception for hosts and sponsors Friday evening at Mt Chase Lodge. Proceeds from the anniversary celebration will benefit the Friends of Katahdin Woods and Waters in their efforts to protect, preserve, and promote the monument and the communities of the Katahdin Region. The Bangor Daily News has agreed to sponsor the event through promotions in its print and online publications to help drive visitation to the event, the monument, and the surrounding communities. Patten, ME — Map Adventures LLC, publisher of the popular Katahdin Baxter Map, Acadia National Park, and other hiking and biking maps, recently partnered with Friends of Katahdin Woods and Waters to release a new map of Katahdin Woods and Waters National Monument (KWWNM). This is the first recreational map of the monument available for purchase, although anyone who joins Friends of Katahdin Woods and Waters before June 30th will receive the map as part of their membership. The new map represents trails and activities for outdoor enthusiasts, including hikers, mountain bikers, fishermen, canoeists, kayakers, and fans of winter recreation. The two major wild rivers that run through the monument, the Seboeis River and the East Branch of the Penobscot River, offer stellar whitewater and flatwater river experiences for paddlers. Families can get a lot out of the monument too, however, they should know that limited services and signage make visiting an adventure. Another unique feature of the KWWNM map is the inclusion of communities, towns, and trail systems leading to the park. It’s one of the reasons that Friends of Katahdin Woods and Waters wanted to partner with Map Adventures on the project. Friends of Katahdin Woods and Waters is also offering a guide of the scenic Loop Road for those visitors who might prefer a leisurely drive to watch for wildlife, or to learn some area history. The Loop Road Interpretive Map is available at the KWWNM’s visitor contact stations in Millinocket and Patten, at the Katahdin Area Chamber of Commerce, and along the Loop Road, which is expected to open to visitors before the end of the May. Friends of Katahdin Woods and Waters is a non-profit 501c3 membership organization made up of individuals and businesses who are committed to working to help protect, preserve, and promote all that is special about Katahdin Woods and Waters National Monument. To become a member, or to learn more, go to www.friendsofkww.org. Based in Peaks Island, Maine, Map Adventures LLC was founded in 1994 by husband-and-wife team Steve Bushey (head cartographer and strategist) and Angela Faeth (designer and project manager). The company has published more than 100 detailed, high-quality maps, including hiking maps and guides for Northern New England, Santa Fe, New Mexico, and the San Francisco Bay Area. For more information, visit www.mapadventures.com. The Katahdin Woods and Waters National Monument map is available from retail outlets in the Katahdin region and throughout New England, and online at www.mapadventures.com. A companion digital version of the map is downloadable through the Avenza PDF Map Store, using the PDF Maps mobile app. You’re invited to a 21+ Oxbow Brewery meet and greet hosted by the National Parks Conversation Association (NPCA) featuring Friends of Katahdin Woods and Waters! Come learn about the vital work of NPCA, an organization which has advocated for national parks since 1919, and how you can be involved in shaping the future of these special places, including Katahdin Woods and Waters. We hope you’ll join us! Your first beer (Maine Beer Company’s Woods & Waters IPA – fitting, right?) is free. To RSVP, register for the event here. Join us for the Second Anniversary Celebration of Katahdin Woods and Waters National Monument presented by Friends of Katahdin Woods and Waters and Maine Beer Company. Plan on joining us Saturday, August 25th to explore the monument and enjoy and an evening celebration at Shin Pond Village in Mt. Chase, Maine. More details forthcoming, but this is something you don’t want to miss. Friends of Katahdin Woods and Waters is excited to be one of the sponsors for the fifth annual Fiddlers & Fiddleheads Fest, taking place Saturday, May 19th at the Lumbermen’s Museum in Patten. You’re invited to join this celebration of spring in the north woods. Musicians from near and far will be playing throughout the day alongside local artisans, craftsmen, and food vendors. Thanks to the generosity of Emera and Case Professional Services, this year’s festival will be headlined by the Muddy Marsh Ramblers. The festival lineup will play on two stages: the Maine Stage and the Log Jam Stage, with performances from Gus Lacasse, Belfast Bay Fiddlers, John Birmingham RFD Band, Donna Chase, and Hannah Boone. If you play an instrument or sing yourself, then come prepared to share a tune at the afternoon jam session scheduled from 4 – 5 PM at the Log Jam stage. Food will be served throughout the day, with all the proceeds from the festival vendors benefiting local non-profits. If you’ve got a great dish involving fiddleheads, send your best fern-friendly recipe to the curator at the Lumbermen’s Museum and you may be entered into a cook-off to crown 2018’s “Cast Iron Chef”. The festival will also include a childrens’ area featuring throwback games from the 20th century. The event promises to be fun for the whole family and we hope you’ll join us. For those of you willing to lend a helping hand to the event set-up and take-down, please email us at info@friendsofkww.org. The Fiddlers and Fiddleheads Festival is made possible thanks to the Lumbermen’s Museum, Friends of Katahdin Woods and Waters, and our fellow sponsors at Elliotsville Plantation Inc., Emera, Katahdin Valley Health Center, Yankee Grocers, Jerry’s Thriftway, Case Professional, and Katahdin Trust. Katahdin Woods and Waters Superintendent, Tim Hudson, will be hosting a meeting to gather public input for the monument’s management plan next week. The management plan will act as a road map to the development of our park over the years ahead. This particular meeting will focus on access to the monument from the Patten/Sherman area and visitor use in the north end of the monument as well as the Seboeis parcel. This is an important opportunity for Friends of Katahdin Woods and Waters supporters who are eager to take an active role in determining how the monument is developed. If you plan on joining us at the meeting, or would like information on future meetings, please email our Operations and Special Projects Coordinator, Sam Deeran. This past Saturday, our Executive Director, Andy, and I set out from the Matagamon Gate (at the north of the monument) for a weekend XC ski excursion with our partners at Appalachian Mountain Club (AMC). AMC is training their members to lead trips into the monument, and they invited us along to recon the trail to our lodging at Haskell Hut, and to share about our ongoing work. It was the final weekend of the Head North Ski Days, and so the trails near the gate were populated by some friendly folks, enjoying free rentals provided by Friends of Katahdin Woods and Waters. For long stretches along the East Branch of the Penobscot, there wasn’t a soul in sight – save for some red squirrels scurrying between the trees. We thought we found some lynx tracks along the trail, but it turned out to be a big, friendly brown lab running alongside a couple from Fort Kent. By mid-afternoon on Saturday, we arrived at the Haskell Hut as snow flurries started up. Haskell Hut is a cozy cabin sitting above the expansive Haskell Deadwaters. When we stepped in and dropped our packs and sleds, the cabin was still warm from the visitors there the night before. From there, we set out to Haskell Rock Pitch, where we built a snowman to keep watch over the rapids. That night, we cooked up some hefty dinners and ate as the sun went down. Around our solar powered lamp, we talked at length with the AMC members about the history of the monument and how they could get involved with the monument planning process. On Sunday, we rose early with the morning sun, made some coffee and ate some chocolate chip pancakes courtesy of Eliza from AMC. On our way back, we took a mile long detour to see Stair Falls. Along the trail, there were stunning views of Bald Mountain and Billfish Mountain, which sits at the Northwest corner of the monument. At the Matagamon Gate, we were welcomed back by Mark and Susan Adams from EPI. They’ve devoted nine straight days to making sure Head North Ski Days was a success, and we’re grateful for their help in gearing us up for our excursion. Thanks also to Kaitlyn and Kim from AMC for leading a safe and fun trip. As we left, the roads were starting to mud up. Spring is making its way to the monument, but there’s still plenty of snow. If you have any questions about our trip, or are planning a trip of your own, reach out. We hope you’ll make a trip north while there’s skiing to be had. We’ll see you out on the trails.